COSHOCTON, Ohio — Love's Pure Light is the theme of the Coshocton Community Choir's Festival Christmas Concert on Sunday, December 3, at 3:00 p.m. The concert is under the direction of Charles R. Snyder and features the 100-voice adult choir, The Coshocton Singers (singers in grades 4 - 8); and the Coshocton Youth Chorale (high school age singers). Pianists Dickie Barrick and Mark Wagner will be joined by the Roscoe Brass Quintet and percussionist Matt Hayes as they provide accompaniment for the choirs. 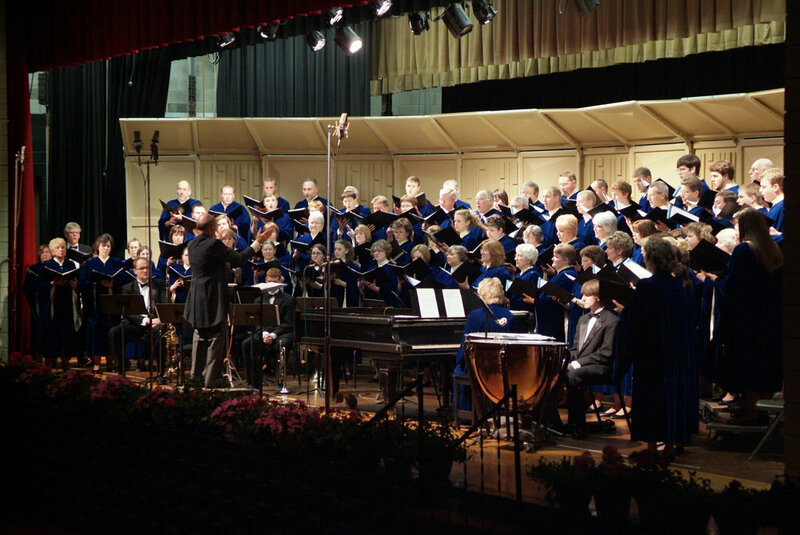 "Each year we have several audience members hearing our concert for the first time and they tell us they are so impressed that a 'community choir' offers such professional and powerful music," said Jan Myers, long-time member of the Coshocton Community Choir. "These first-timers become regulars who look forward to our concerts each year, and we invite others to this concert!" The Christmas concert theme, 'Love's Pure Light,' is a line from the carol 'Silent Night.' "Like last year’s 'O Holy Night,' it’s always helpful when we choose a theme that comes from a familiar song that may strike a chord with people," said Snyder. "During the Christmas season, my family, like many others, always looked forward to driving around to look at the Christmas lights. There is also something peaceful and renewing about sitting at home and staring at the lights on the Christmas tree. It's a chance to momentarily disconnect from all the negative news and enjoy the small twinkling beacons of light." "For many of us, Christmas lights are a reminder of God's pure gift of love that first Christmas by sending his light into the world. We think the Community Choir concert will also be a source of light and hope as we begin the Christmas season. The songs we’re rehearsing are filled with messages of light and love, and the narration by the Rev. Richard Hoover will further expand on these ideas." A new song in the Community Choir’s repertoire is Craig Hella Johnson's juxtaposition of the traditional carol 'Lo, How a Rose E'er Blooming' with the 80s popular hit, 'The Rose.' "It is surprising how well these songs, written hundreds of years apart, fit together so beautifully," added Snyder. "Jack Schrader's arrangement of the spiritual 'Rise Up Shepherd and Follow,' enhanced by Don Kason’s addition of 'big band' brass and percussion, has become an audience and choir favorite. The concluding and rousing 'Rise, Shine' will encourage us to go out and light up the lives of others this holiday season." Dr. Susan Hasseler, the new president of Muskingum University, together with her husband, Ken, will be greeting concert goers as they arrive. Twenty-nine members of the Community Choir have some connection with Muskingum as current students, alumni, faculty and staff. The Coshocton Community Choir concert will be held at McKinley Auditorium located at Coshocton High School, 1205 Cambridge Road at 3:00 pm. Tickets for the December 3, "Love's Pure Light" Christmas Festival Concert are $10 for adults and $5 for students and are available from choir members, at the door or by calling Business Manager, Lee Bown at 740-622-3960. Tickets can also be purchased online at www.CoshoctonCommunityChoir.org. Pre-sale tickets are also available from these outlets: the Coshocton Visitors Bureau and Annin Showroom in Roscoe Village; Buehler's Foodmarket and Marilyn's Natural Foods in Coshocton; Home Loan Savings Bank in West Lafayette and at Baker's Foods in Newcomerstown. To find out more about the Coshocton Community Choir (now in its 47th season), the Coshocton Singers (in it's 31st season, founded as the Coshocton Children's Choir), and the Coshocton Youth Chorale (now in it's 16th season) call the choir office at 740-623-0554, check out the Coshocton Community Choir Facebook page, or visit their website www.CoshoctonCommunityChoir.org.